It is a time of legends, the entire galaxy is one mighty battleground which see the indomitable space marines locked in a bitter civil war, divided by the heresy of Horus. Some chapters remain loyal to humanities greatest leader; the Emperor, while others have chosen the chaos tainted promises of the Emperors favoured son. The leaders of this mighty legion are the Primarchs, super-human warriors and the pinnacle of the Emperors genetic enhancement, created in his own image. Even these almost god-like beings - Princes of the galaxy - are not immune to treachery and they will fight one another as the whole Galaxy burns in flame. The age of darkness has begun. Collected here are four novella length stories that focus on some of mankind's greatest warriors, Fulgrim of the traitorous Emperor's Children, Alpharius of the Alpha Legion, El’Johnson of the Dark Angels and Ferrus Manus who leads the Iron Hands. Edited by Christian Dunn and written by the talented authors Graham McNeill, Nick Kyme, Gav Thorpe and Rob Sanders. 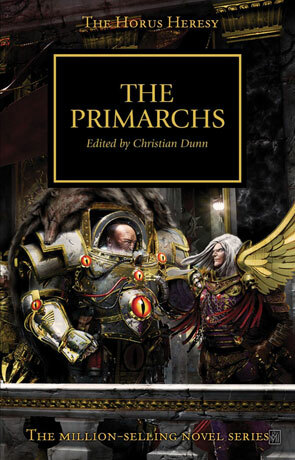 The Primarchs is an excellent collection that not only provides a greater insight into the personalities of these post-human leaders but the stories manage to epitomize the struggle that is the Horus Heresy. The way that each of these authors manages to capture the other-worldly, almost godlike presence that the Primarchs wield is great. The book also sets up some great events to happen later in this epic series. As such it's an essential purchase for anyone reading the Horus Heresy series. The way that each of these authors manage to capture the other-worldly, almost godlike presence that the Primarchs wield is excellent and each of these stories are well worth a read. Rather than directly follow Fulgrim we instead witness this story through another well known character, that of Lucius. Captain of the 13th company in the Emperors Children chapter and one of the finest swordsmen in the galaxy, he is unbeaten in battle and eventually goes on to become Lucius the Eternal, Champion of the Chaos God Slaanesh. The story itself is excellent and gives a great insight into the Emperors Children, the characters of Lucien and of course Fulgrim. Pretty much gripping all the way through, you will be hard pressed to find a better Warhammer 40 Novella. Here it's the turn of the Iron Hands chapter and the Primarch Ferrus Manus (known as "The Gorgon") who leads his Iron Warriors in a fight against the deadly, very alien Eldar. The story is told in a very effective manner and is different enough to the first novella to make a nice chance. The pace however did feel a little slow in places but this is more than made up for by the description of the otherworldly Eldar. Gav Thorpe is a great author and he really gets a chance to shine here. El’Johnson "The Lion" leads the Dark Angels, the first chapter of Space Marines and intensely loyal to the Emperor. We join these warriors as they are travelling through the warp on board their ship and become attacked by an unknown and deadly force. This is my favourite story of the collection, the Dark Angels are great and I loved the depiction of the fight on board ship which is dramatic, claustrophobic and excellently paced. The space based story makes a nice change and the author manages to weave a powerful story. The Alpha Legion take center stage, led by the Primarch Alpharius and again the style of story is quite different from the others in the collection. Here we get a great sense of structure, of order to the Legion and Sanders descriptive almost elegant prose proves very effective. The pace and tension builds as the story progresses, with an unexpected twist too. A great story from an author who just seems to get better and better the more he writes. Written on 11th June 2012 by Ant.